How to downgrade a Nexus 7 tablet from the default Lollipop operating system to the older version of KitKat. I was racking my brain for days trying to figure out how to get a Nexus 7 tablet to display a Flash presentation I put together. I tried plugin after plugin to no avail and then I read that if I were to downgrade from Lollipop 5.0.2 to KitKat 4.4.4 the tablet would not only display flash files, but it would also have better support for video so I began the arduous process of this diabolical downgrade. First, let me say that I ran into the same issue with this tablet running KitKat and playing Flash files as well. I did find a solution, but I wanted to make that point clear. This post is about how to downgrade your new Nexus 7 tablet specifically the Nexus 7 tablet 2013 (Mobile). I noticed a lot of people looking for this info and had a hard time finding the right combination of image files for the device I was working on. So in the interest of not pulling out all my hair next time I had to do this a post was born. Be sure to back up your tablet as restoring a previous image will wipe your device clean. Also restoring an OS that didn’t come installed on your device by default may void any warranties you have on your device. Extract the contents from the .tgz file to your machine. Extract the image file from the .tar. Extract this somewhere we’re going to come back for this image after the next step. Download ADB and install (Android Debug Bridge). This is the program you’re going to need to access and flash your device. Once ADB is installed your going to put the files you extracted in step 2 inside of your abd-tools folder. Turn off your tablet. Press the power key along with the volume down at the same time until you see the bootloader screen. We’re unlocking the bootloader on right now. It will be locked. 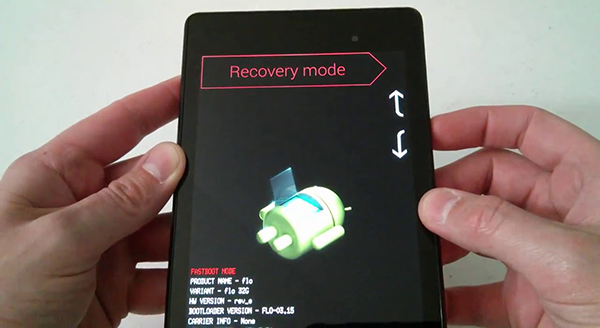 Navigate to “Recovery Mode” and press the power button. Once your device starts back you’ll be using ABD to execute shell commands. I separated these commands below. Type them in the order listed below to wipe your device clean and install the new image containing KitKat 4.4. This is a stable image I found that will get you 2 versions of KitKat lower than you want, but once the new OS is installed it’s just a matter of letting your device download 2 KitKat updates to get you to 4.4.4. This step flashes your bootloader type. This is the final step where you will flash the 4.4 Factory image. If you’ve followed the directions properly when your device reboots you should see a different startup animation for KitKat. This is the first indication you did things correctly. I had a few issues when preparing my presentation so I thought I’d include a couple more links that I found handy. Maybe you’re in the same boat.